DO you remember those wooden rulers on sale at Woolworths with the names and dates of all the British Kings and Queens on the back? That was the kind of history I learnt at school. Regrettably, a lot of alternative history isn’t much better with a similar emphasis on London-based leaders. I’ve always preferred to read about radical lives and politics away from the metropolitan bubble and Andrew Lee’s new history of Sheffield’s pioneering socialists and anarchists is a perfect paradigm of “people’s history”. ANDREW Lee’s book embodies the ideals it chronicles with a beautiful cover designed by libertarian socialist Walter Crane. The text is printed on decent quality paper and it’s lavishly illustrated with numerous portraits and political posters. 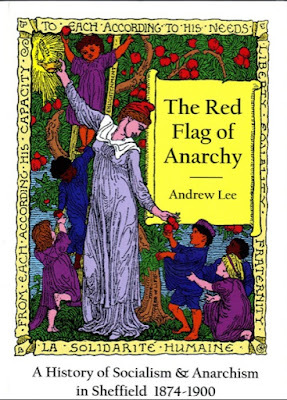 Computer screens might usefully churn out dry facts but Andrew Lee appreciates that wisdom is more surely gained through a slow, aesthetically pleasing book-read and there is a lot to mull over in “The Red Flag of Anarchy”. Focussed on the Sheffield scene from 1874 to 1900 the author depicts a rich political culture created by predominantly working class activists of every flavour. He doesn’t push any political line but the book is suffused throughout its 178 pages with an inspiringly libertarian spirit. Lee’s achievement is to conjure up a vivid picture of a welcoming, inclusive yet militant socialist milieu. Activists who for an all too brief moment managed to create the germ of a new society within the shell of the old. An alternative society that created communist colonies, embraced gay lifestyles, published a regular anarchist newspaper, operated a “Commonwealth Café”, organised picnics and ran raffles with books by Bellamy and Thoreau as prizes or alternately “A Handsomely Framed Portrait of Ravachol”! “The Red Flag of Anarchy” is invaluable not just for its contents but as an inspiration and model for socialists all around Britain to get your shovel out and start digging down into your own local libertarian past. I know from my own researches that there’s always been far more going on out of London than our erstwhile chroniclers would have us believe. I have just two criticisms which I hope Andrew might address in future editions. The first is the absence of an index. This isn’t so much of a handicap as it would be in a text-only volume as the extensive contents list and numerous illustrations facilitate navigation but digitisation makes compiling an index simple and speedy. Secondly I would like some analysis of why Sheffield’s socialist oasis became barren. At the end of the book Lee observes, “It was the end of an era, everything was going to change…Parliamentary politics was to become the order of the day” but it wasn’t inevitable, what exactly occurred in Sheffield? My own research, for example, shows that in Leicester all manner of socialists cooperated for years until the foundation of the ILP in 1893. Thereafter Leicester ILP refused to have any truck with local anarchists whose direct-action was thought detrimental to attracting votes. ILP sectarianism thus transformed Leicester’s lively socialism into bureaucratic electoralism. Were the same forces at work in Sheffield? If we are ever to regain the radicalism and comradeship of early socialism it’s crucial that we identify what went wrong last time. Andrew Lee reminds us of an era when Labour Clubs were far more than dreary drinking dens. Available from Amazon for £10.00, in my opinion “The Red Flag of Anarchism” is the most valuable and entertaining study of grass-roots, pioneering Anarchy in the UK since John Quail’s classic “Slow Burning Fuse”.